Hear ye, oh aspiring Cerebral Metalhead review alumni: if you want to guarantee an album review, remember to package your new album (along with your last three) in a hand-crafted box set with a personalized 12-page handwritten booklet attached. That's what Baltimore keyboardist/composer/arranger Dan Britton did, and even though the new album by his Deluge Grander project has zilch in the way of heavy riffage or sonic extremity, I appreciate the personal attention too much not to respond in kind via my humble metal blog. I also admire the honesty of Britton's approach. He opines "Not many bands have managed to combine earnestness and pretension, and those are the goals of both this music and this package." You've basically just done my job for me, Dan. On The Form of the Good, Britton and his bandmates work through many of the same aesthetic issues that early Genesis, King Crimson and One Size Fits All-era Zappa addressed, namely how to legitimize rock 'n roll as art music. In its string, woodwind and brass-laden instrumentation and suite-like structures, The Form of the Good aims for symphonic excess; its guiding conceptual framework (a confluence of Platonic ideals and what Britton calls "the over-emphasis on differences between urbanism and naturalism by modern humanity") is delightfully grandiose and intentionally vague, in fitting with the complex ideas in Deluge Grander's music. 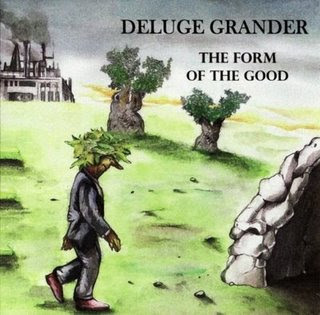 The best part about an album like The Form of the Good being composed now is that I can appreciate it on its own terms instead of relative to Deluge Grander's prog-rock forbears. The pretension fades when there's no intention of breaking new ground, and I can concentrate instead on how hard the band's rhythm section jams on "Common Era Caveman," how the last five minutes of "Aggrandizement" just keep getting denser and more oblique in the most awesome ways. I'm also in love with the album's earthy production. Brass often sounds more like bleating sheep, violins buzz like tinny ham radio transmissions and it's mastered low, begging for a twirl of the volume knob. All of those traits feel like loving homage to the early Crimson records. Everything's clearly mixed and the band's rock nucleus (keys/guitar/bass/drums) is perfectly balanced with Britton's big orchestrations. Most importantly, the thinness of the recording lays bare the depth of the compositions, especially the two 14- to 2o-minute tracks. More slickly-recorded albums ought to aspire to the personality of The Form of the Good. For a DIY classical tinkerer, Mr. Britton, ya done good.